I started this diary last year on my 47th birthday. Tomorrow marks the passing cycle of another 365 days. And what have I learned in this time? I’ve learned that when you dwell in fear you will lose what you were AFRAID of losing. The things that you were afraid might happen, happen. And the opportunities you were afraid would never come your way, never do. The flip side of the coin? When you have Faith, when you BELIEVE beyond a shadow of a doubt – you can move mountains. Now, I am certainly not interested in changing the topography of the world. But I am interested in changing MY world. My world starts with me. Over the next 365 days I will put my Faith in my abilities and talents to be a better and clearer expression of who I am. I will listen to that inner voice that says you are loved and you are beautiful in every way. And I will BELIEVE; in Family and Friendship, Hope, Charity and Love, Honesty, Freedom and Music. 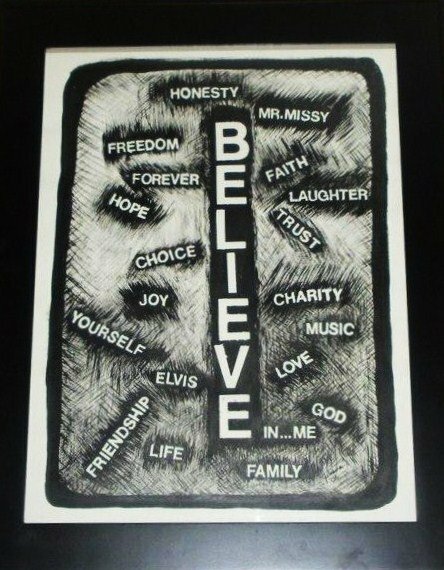 I Believe in ELVIS and I BELIEVE in ME.